So this Friday, I'm taking in two AFT rescues. The lady who has them says they were surrendered to her at her work recently, and she's been trying to find them homes. We both agree that the previous owner had no idea what they were doing. 1. 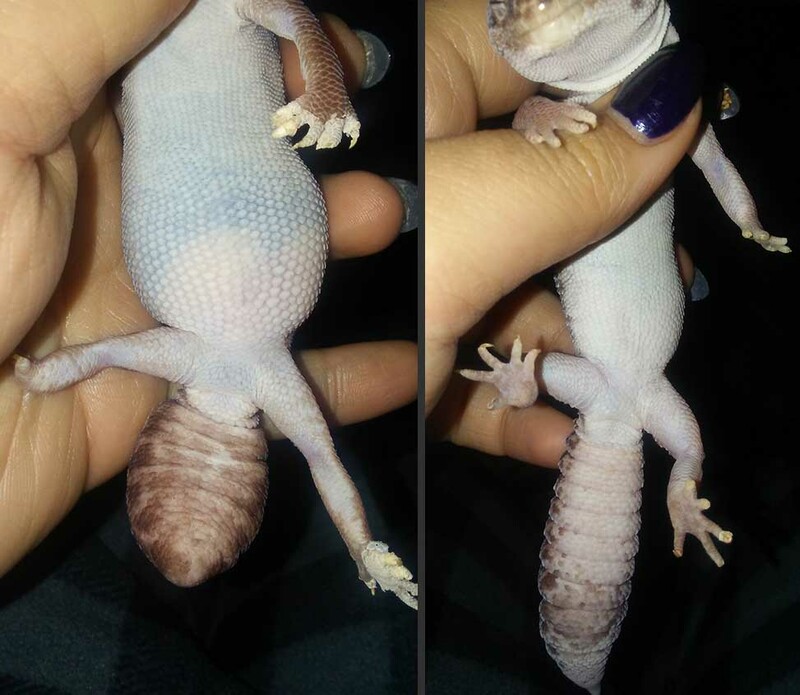 Most of their toes are missing, and they appear to be covered in stuck shed. I told the lady how to get it off gently, but I'll see friday. 2. They're currently living on sand. I'm changing to peat moss once I get them. 3. I believe they're currently both being housed in a 10gal together and have only 1 hide. I have a 20L gal that I'll be putting the pair in, including more hides. 4. One of the two is abnormally large in the belly. I suspect she's pregnant, impacted, or obese, though I fear impaction. I was told pregnant females don't typically get that big, and I can't tell if she's overweight in other areas (I have no pics of her back). The lady says she's been eating well and pooping fine, so I am unsure. The larger one is 12, the smaller is 7. I don't know if that's a factor. 5. I'm /pretty/ sure they're both female, but I'm second guessing myself since I can see slight pores on the larger one. Are they for sure both females? If not, I have another home lined up that can take one or both if things don't work out. I am not looking to breed. I own a leo, these will be my first fat tails. I know they need decently high humidity unlike a leo, but to my understanding, they're very similar in care. Any advice and tips are much appreciated. If I can't handle these girls, I have another good home I could give them to. I just want to get them out of where they are. The lady who has them now is trying her best, but she's unfamiliar with reptiles. Just got the gecko girls here. They still had stuck shed on their feet. Took a while, but got most of it off. They're pretty stressed, so I'll get the last bits off tomorrow. The fatter one's belly is very dark and green, almost certain she's impacted. Looks even darker than the photo in person... I'm afraid she may have MBD (metabolic bone disease). She's not very strong, kinda drags her weight, has a hard time supporting herself on her legs. Also her head looks slightly misshapen, and she's pretty small compared to the other and she's supposedly the older of the two. Their vet visit is Monday, but I'll be keeping a very close watch on them until then, especially the fatter one here. I'll be giving her daily soaks until the vet can tell me what to do next. Luckily, the slimmer of the two seems in fine shape, able to lunge at her prey and moving around well. I think there's certainly hope for that one. Another update on my girls, now named Nugget (the more sickly stubby-tail) and Poot. Turns out, the vet told me Nugget is not impacted, thankfully. She believes it might be cancer, especially considering she's 12 years old, but no immediate threat. As long as she's eating, moving, and passing food, she'll be fine. It's really bittersweet, knowing she probably has cancer. I know eventually she will start to fade, but hopefully she'll be fat and happy for some years to come. Once her quality of life starts to dwindle, I'll have to make the choice. Poot is 7 years, and seems to be in fairly healthy shape. Neither have MBD, but the vet believes they're a little low on calcium. I'd assume they didn't have much with their previous owner(s), since they spit out dusted crickets (but will eat them after a few bites). But dustings and some sunlight will do the trick over time. Glad you took them in. In general I think fat tails are no harder to care for than leos. They do sometimes need some judicious hand feeding. I had one fat tail that had an enlarged liver. There wasn't anything the vet could do for them, but I hand fed her and kept her going for nearly a year. Thanks! Yeah, they're fairly similar, though my new girls are calmer than my leo, haha. I've noticed that also, they're still a little too slow/weak to catch their food, and my Nugget doesn't strike at all. I don't mind hand feeding though, honestly. The vet said Nugget's liver looked large too. I hope my baby still has a while to go. I'm not sure much can be done for her. I know she's not in immediate danger, but I know I will have to deal with it eventually.